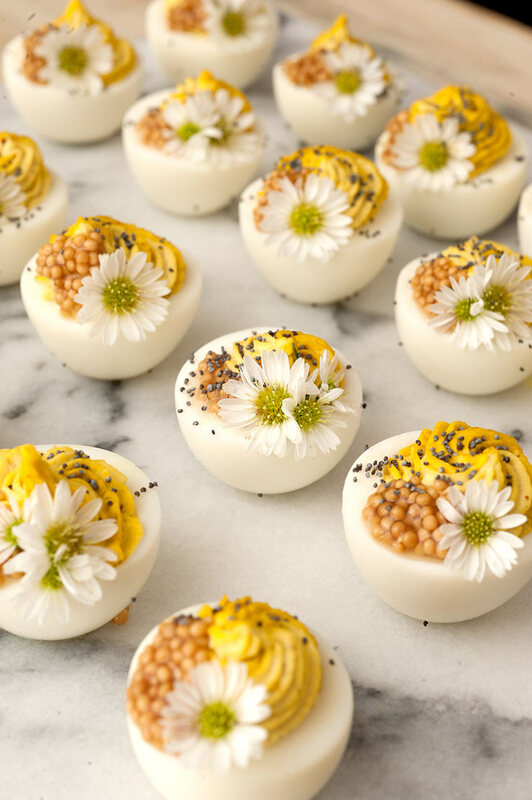 Multi-colored deviled eggs are so simple to create and look so pretty! 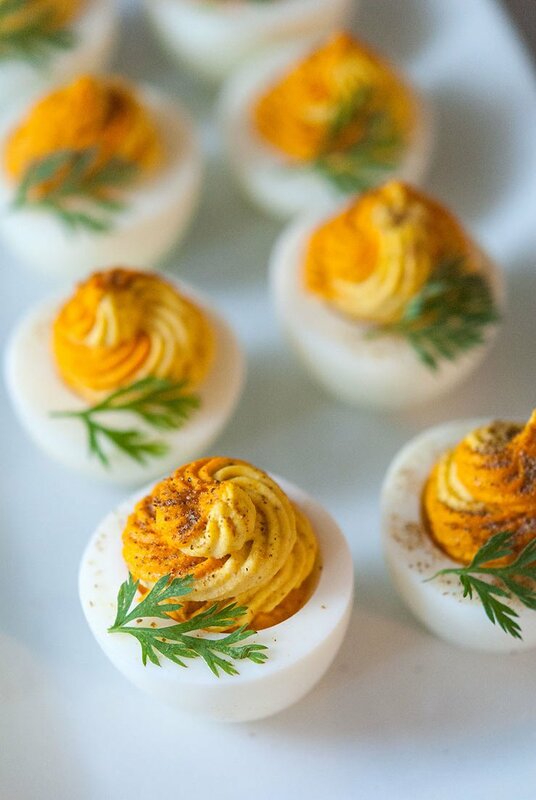 I’ll show you how to create these two-tone deviled eggs in just a few steps. A lot of people ask me how I make my deviled eggs multi-colored. It’s such a fun trick that’s so easy to do! Deviled eggs with the egg white dyed is fairly common, but I’ve never really liked the look, myself.I think a multi-colored filling is more unexpected and fun. You can use the technique below to add more than just two colors, too! All you need are two small bowls (if you’re doing 2 colors), 2 squares of cellophane and a pretty, natural food dye. You can also use another ingredient with a similar consistency as your egg-filling, like hummus or creamy guacamole. You’ll also need a pastry pipping bag and a pretty tip, otherwise you’ll have trouble getting your colors to blend nicely. 1. You can use almost any kind of pastry piping tip, but make sure to choose one with an opening that isn’t too tiny. 2. – 3. Mix your filling and separate it into two bowls. Add your dye to one bowl and mix. 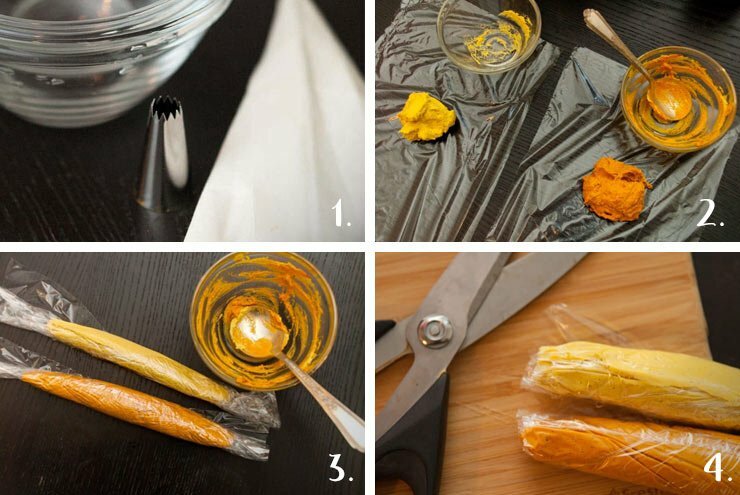 Spoon your filling onto cellophane, then roll it up into 2 tubes. 4. Once it’s rolled, you’ll want to snip then ends, then place them side by side in your pastry piping bag so that the filling comes out evenly in both colors. You Can Get Creative With Other Ingredients too! 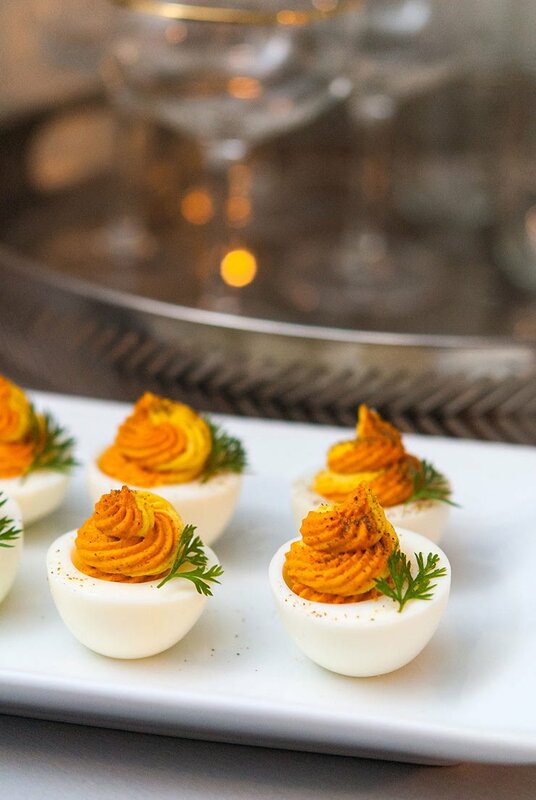 One of my favorite deviled eggs to make is this spicy, two-tone hummus deviled egg. It was pretty enough with the two ribbons of filling, but I thought I’d add a few crunchy and floral accruements to it too. Hummus has a perfect texture to combine with deviled egg filling! It’s almost exactly the same. 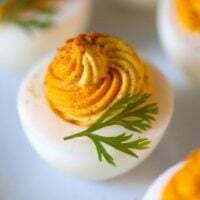 For the lovely deviled eggs in the recipe at the bottom of this page, I made one curry ribbon of filling and gave it a little color-boost with a natural, orange dye. Lets get started! 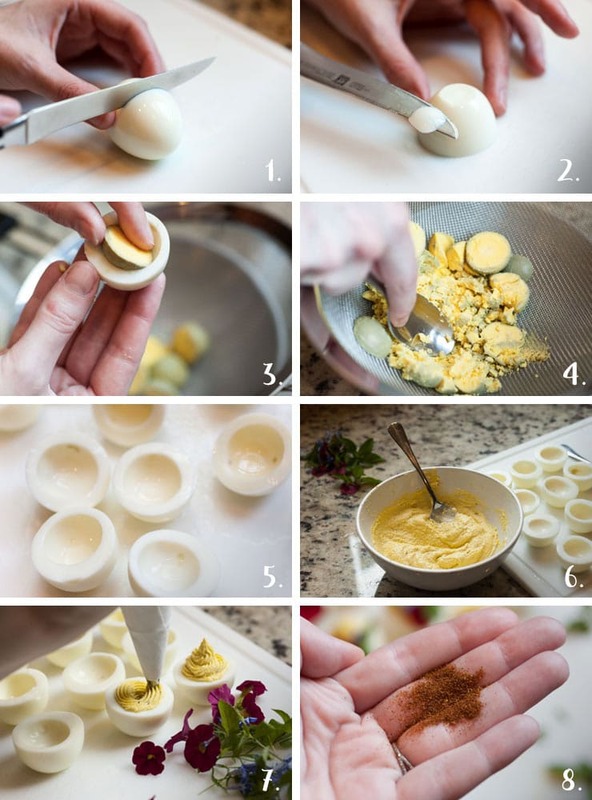 First, by making perfectly boiled eggs and creating a smooth, creamy filling. If you want to see a few more pretty multi-colored deviled eggs, take a look, and help yourself! 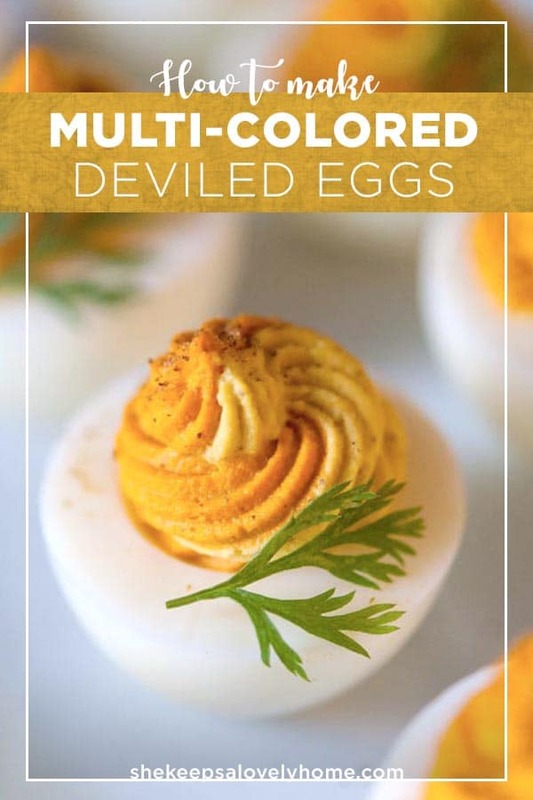 These multi-colored deviled eggs are so original, beautiful and delicious! You’ll require a pot, mesh strainer and 2 mixing bowls for this recipe. 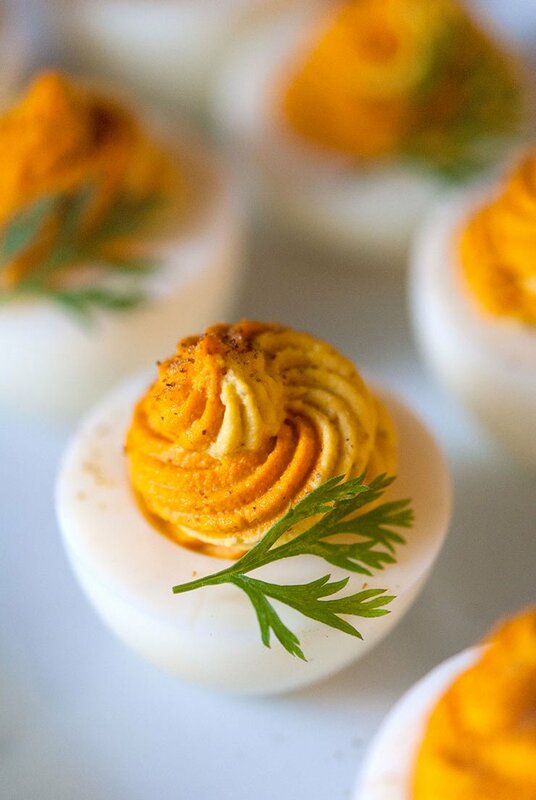 You’ll also require a pastry piping bag for these deviled eggs to ensure your ribbons of filling are perfectly mixed. Separate your filling into two bowls, equally. To one bowl of filling, add your curry and 1-2 drops of dye. Mix thoroughly. All curry powders have different strengths so start with a teaspoon and add more if you think it needs more flavor. If it begins to thicken up with the spice, simply add more mayo so the consistency matches your other bowl. Lay down two pieces of cellophane on a flat surface and spoon filling onto each. Roll them up so you have two tubes of filling. Place both of your tubes into a pastry piping bag, and squeeze into your egg halves. It helps to do a little test first to make sure they’re coming out perfectly together. Garnish with your carrot fronds, or any pretty garnish you choose.